Bologna University scientists led a study, believed to be the first of its kind, to investigate the effect of the Mediterranean diet on bones – and weight – adding to the growing string of health benefits linked to the diet. Nearly 1,150 volunteers were followed over a year. Their bone density was measured both at the start and end of the EU-funded trial, which involved British, French, Dutch and Polish researchers. 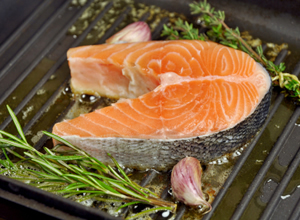 Half of the participants, who were all aged between 65 and 79, were asked to follow a Mediterranean diet. The others were not. For volunteers with normal bone density, the diet had no significant impact. But, it was found to offer benefits for osteoporosis patients. A Mediterranean diet consists mostly of fruit, vegetables, nuts, olive oil and fish and could prevent millions of at risk patients from breaking their hips. Osteoporosis affects over two million people in the UK; more than double the number of people affected by dementia. Every year 300,000 people suffer a fragility fracture (a broken bone resulting from a fall at standing height or less), including over 70,000 hip fractures and women are more at risk than men. 1,150 people die every month in the UK following a hip fracture and the UK has one of the highest rates of fracture in Europe. Osteoporosis is a progressive condition that leads to more fragile bones as you get older. Fragile bones are more likely to break easily, and bones in your wrist, hip and spine are particularly vulnerable. Bone is a living tissue and new bone replaces old bone throughout life. But in later life, the cells that build new bone can’t work as quickly as the cells that remove old bone. This leads to an overall loss of bone tissue, which makes bones weaker and more fragile. About 1 in 2 women and 1 in 5 men over 50 will break a bone (fracture) because of osteoporosis so it is important to keep your bones healthy. Unhealthy lifestyle – low physical activity, smoking, excessive alcohol, lack of calcium and vitamin D.
This new research indicates that millions of osteoporosis patients should eat a Mediterranean diet to lower their odds of breaking their hip. This diet also has many other advantages as it confers health benefits including wight loss, heart disease, Alzheimer’s and cancer. This also means cutting down on salt, red meat and sugary drinks and foods and reducing saturated fats, but the odd glass of red wine is also encouraged!. Throughout our lives our bones are broken down and replaced with new bone. It is oestrogen that clears away old bone, but it is progesterone that builds new bone. Often women are given only oestrogen HRT to help with osteoporosis but this is only half the story. Oestrogen will prolong old bone but unless there are also good levels of progesterone strong new bone is not being built to replace the old weakened ones. Osteoporosis prevention needs a number of things: good hormone levels, plenty of weight bearing exercise and a diet that also includes good levels of vitamin D which the researchers also gave to participants. 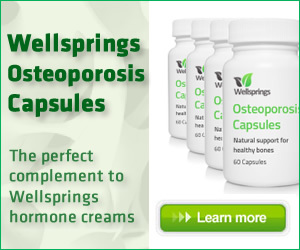 For additional help an Osteoporosis supplement by Wellsprings contains a specific combination of vitamin D, essential bone nutrients vitamins C, D and K and minerals Calcium, Magnesium, Boron and Manganese for women with osteopenia or osteoporosis and best used with our Serenity cream for maximum support.